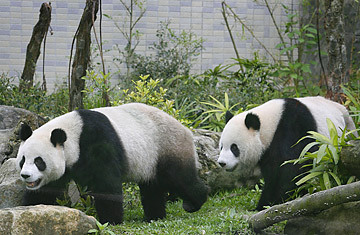 Pandas Tuan Tuan and Yuan Yuan walk around inside their enclosure at the Taipei City Zoo. China's Gift to Taiwan: Fake Pandas! The origins of April Fools' Day are shrouded in mystery. One long accepted explanation had to do with the transition between the Julian and Gregorian calendars, when folks who continued to celebrate the old new year (which fell in late March or early April) were called April Fools. But that proved to be a bit of a joke because the calendar change was actually gradual and no one was quite caught off guard. Various other festivals have been cited as inspirations, including the east Asian festival of the burning of the scholars on the new moon of the fourth lunar month (the equivalent of April 1 in the western calendar). The holiday began to evolve (or devolve) 2,200 years ago after Qin Shihuangdi, the unifier of China, infamously set fire to books and gazettes that he disagreed with; today it is celebrated by "sacrificing" jokey messages to the gods, setting slips of paper aflame like incense in hopes that the amused divinities will rain down good fortune. Once in a while, though, the gods are inadvertently enraged and burn journalists. April Fools! See pictures of famous pranksters at Life.com. Read about April Fools' Day pranks to try in the office.